Classic Glee Gum is sweetened with cane sugar, traded in compliance with Fairtrade Standards, total 42%. It is also sweetened with brown rice syrup. 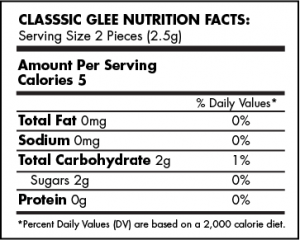 Allergen Information: All Glee Gum is vegetarian, Non-GMO Project Verified, certified kosher, additive free, dairy free, wheat free, gluten free, egg free, yeast free, nut free, and peanut free. Manufactured in Facility: with Soy present.